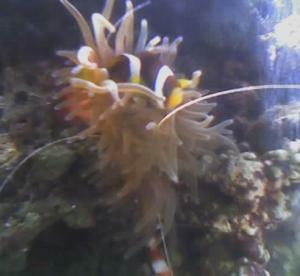 A CBS being consumed by an anemone. Who Took It? >Hi Guys, >>Hello. >I can't begin to tell you how good this site is, you're very generous to give up your time to answer all these questions. Well, in keeping with tradition, I have another question for you: Quite recently I've noticed that a couple of the antenna on one of my cleaner shrimp are considerably shorter than they used to be, I can only think that they've been nipped off by one of the other tank residents. The suspects are either 1 of the 2 false Perc clowns, a royal Dottyback, small red legged hermits (surely not) or the other cleaner shrimp. The 2 clowns had been in my 30g tank for about a month before I added the royal dotty and the 2 cleaners (at the same time). I've heard that royal Dottybacks can become aggressive but would it bite the antenna off of cleaner shrimp? >>I think that wouldn't be impossible. Not highly likely, but not impossible. >Also will the antenna grow back or is poor old shrimpy permanently disabled (not that it seems to bother the shrimp at all). >>It should grow back within the next molt or two. >If the royal dotty is the culprit is there anything I can do about it? >>If it's the culprit, there's not much to do but remove it. Surely can't be 'trained'. But, if it's really the perpetrator of this crime, then one of two things has happened - they've drawn their borders which both respect, or you'll be seeing more damage and can better determine the criminal in action. >Thanks in advance for your help and advice! Mark (Essex, UK) >>You're quite welcome, sorry for the delay (recompiling my kernel on my main machine, and was blessed with the loan of a working laptop!). Marina >P.S. Below is one of the previous questions I asked, unfortunately you guys didn't get round to answering it….I understand you must have a hell of a lot to answer! Cheers once again! Shrimp Compatibility Hi Bob, Thank you again for the information and help you provide. 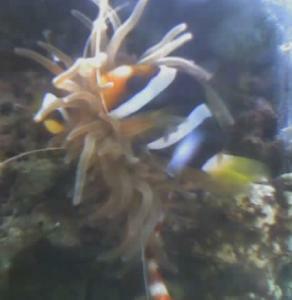 Here is another compatibility question: 300 gallon live rock / live sand reef tank. I have 5 huge common cleaner shrimp, Lysmata amboinensis, already in it. Pretty much just herbivore fish. I would like to add another variety of shrimp to the tank. I want to avoid companion killers, crab predators, fish murderers, and, most of all, the dreaded Shrimp Wars that you talk about. Some candidates are Lysmata debelius, Lysmata wurdemanni, and Stenopus hispidus. Who would be your vote for Mr. / Ms. Congeniality? <Hmm, either L. debelius or a couple of S. hispidus... due to the size of your system, plenty of hiding spaces, good husbandry... these should get along. Do feed existing tank right ahead of their introduction. Bob Fenner> Thanks! Dale M.